This information has been compiled from multiple sources. Lyme Disease was first recognized in the United States in 1975 by Dr. Allen Steere, following a mysterious outbreak of juvenile rheumatoid arthritis near the community of Lyme, Connecticut. The rural location of the Lyme outbreak and the onset of illness during summer and early fall suggested that the transmission of the disease was by an arthropod (insect) vector. In 1982, the cause of Lyme Disease was discovered by Willy Burgdorfer, who isolated bacterial spirochetes belonging to the genus Borrelia from the guts of Ixodes ticks. 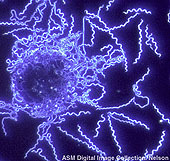 He showed that these spirochetes reacted with immune serum from patients that had been diagnosed with Lyme Disease. Subsequently, the bacteria was given the name Borrelia burgdorferi. Since then, reports of Lyme disease have increased dramatically to the point that the disease has become an important public health problem in some areas of the United States. Today, Lyme Disease is the most prevalent tick-borne illness in the United States. Incidence of Lyme Disease in the United States, 1991-2006. From 1991 to 1994 there were less than 10,00 new cases per year reported to the CDC (Center for Disease Control). Between 1996 and 2001 the average number was about 17,000 new cases per year but increased to near or above 20,000 new cases per year in 2002. In 2006, there were 19,931.
each year from the 1991 new cases per year averages. Lyme Disease is most commonly transmitted by a tick bite (usually painless). The tick vector (click here for images of different tick species) include but are not limited to, Ixodes scapularis (Deer Tick), Amblyomma americanum (Lone Star Tick) and Ixodes pacificus (Western Black Legged Tick). Ixodes dammini was once thought to be the only species responsible for transmission until it was shown to be the same as Ixodes scapularis in 1993. The Deer and Lone Star ticks can be found in many areas. The ticks prefer to live in wooded areas, low growing grassland, seashores and yards. Depending on the location, anywhere from less than 1% to more than 90% of the ticks are infected with the spirochetes that cause Lyme Disease. The most notorious of the tick species that transmit Lyme is the Deer tick. Not only are they tiny and difficult to detect, they also have a distinctive growing period that makes them especially dangerous for Lyme transmission. The Deer tick has a 2 year life cycle where it must feed 3 times so that it can grow and reproduce. The first feeding occurs In the larvae stage, when it is tan, the size of a pin head and generally feeds on small animals like the mouse where it can pick up the spirochete. Having fed once, it grows and enters the nymph stage where the tick is the size of a poppy seed, beige or partially transparent and feeds on larger animals such as cats, dogs and humans. From that second feeding, it finally matures into the adult tick. This is when they are black and/or reddish and feed on cattle, deer, dogs and humans. Once the adult female tick has fed that third time, she is ready to mate and reproduce to continue the tick cycle. As the pictures show, ticks can be very difficult to see and tell which species is which. A quick way to identify the female Lone Star tick which is also a carrier of Lyme, is to look for it to have a grey body with a white dot on its back. While April through October is considered the "tick season", Lyme disease can be transmitted at any time. Ticks are extremely active in the spring and early summer but Deer ticks are found year round including wintertime. So make sure to remember that a bite from a tick can happen at any time, not just the warm months of the year. Cases of Lyme disease in the U.S. have been reported in virtually every state, although the Northeastern, Great Lakes, and Pacific Northwest areas are particularly endemic. Lyme disease is also a serious problem around the world wherever there are ticks. The disease is common in Europe, particularly in forested areas of middle Europe and Scandinavia. The Borrelia family is also responsible for tick infections in Europe, but different subspecies ( B. garinii and B. afzelii) may be more common there and cause slightly different symptoms. The infection has also been reported in Russia, China, and Japan. Lyme disease is called the "Great Imitator" because it can mimic many other diseases, which makes diagnosis difficult. Many Lyme patients were firstly diagnosed with other illnesses such as Juvenile Arthritis, Rheumatoid Arthritis, Reactive Arthritis, Psoriatic Arthritis, Infectious Arthritis, Osteoarthritis, Fibromyalgia, Raynaud's Syndrome, Chronic Fatigue Syndrome, Interstitial Cystis, Gastroesophageal Reflux Disease, Fifth's Disease, Multiple Sclerosis, scleroderma, lupus, early ALS, early Alzheimers Disease, crohn's disease, ménières syndrome, reynaud's syndrome, sjogren's syndrome, irritable bowel syndrome, colitis, prostatitis, psychiatric disorders (bipolar, depression, etc. ), encephalitis, sleep disorders, thyroid disease and various other illnesses. Some people develop symptoms very soon after being bit by a tick. However, some people who have the disease do not develop symptoms until quite some time after the disease causing bite. In some cases, it may take years for any symptoms to show at all. Symptoms may also slowly reveal themselves over a long period of time with patients showing up at their doctors with vague, varied symptoms and no knowledge of a tick bite or rash. A bite from a very young tick that is very small may not leave a rash or a bite mark. There are even some people who have been exposed but may never develop Lyme symptoms. At this point, it's not yet known even how long the bacteria may lie dormant. The most well known symptom of Lyme Disease is a rash at the site of the bite. A rash can appear several days after infection, or it may not develop at all. Only about 30% of people infected develop the tell-tale 'bulls-eye' rash (erythema migrans) from a tick bite, and even then, physicians often miss it. If it does develop, it can last a few hours or up to several weeks. It can look like a classic rash or it can look more like an allergic welt (click here for images of different Lyme rashes). The rash can be very small or very large (up to twelve inches across). The "bullseye" rash is generally a round ring with central clearing. Unfortunately, this is not the only rash associated with Lyme. Various other rashes associated with LD have been reported. One bite can cause multiple rashes. The rash can mimic such skin problems as hives, eczema, sunburn, poison ivy, flea bites, etc. The rash can itch or feel hot or may not be felt at all. The rash can disappear and return several weeks later. For those with dark skin the rash will look like a bruise. If you notice a rash, take a picture of it. Some physicians require evidence of a rash before prescribing treatment. Early Symptoms: Several days or weeks after a bite from an infected tick, a patient usually experiences "flu-like" symptoms such as aches and pains in their muscles and joints, low grade fever, and/or crushing fatigue. The above is a list of possible symptoms. Other symptoms not listed may also be present. They can occur in any combination. You may have one or several symptoms but not everyone will experience every symptom. Lyme affects each host in a different way. Having one or many of these symptoms does not indicate that you have Lyme disease. Diagnosis for Lyme is a clinical one and must be made by a physician experienced in recognizing LD. A variety of tests are available. Many doctors who are unfamiliar with Lyme disease may just use the Lyme test available in their local laboratory. The most common used are the EIA, the ELISA (often called "Titer Test”), the IFA or the PCR-DNA probe test. One of these tests will generally be the first line of testing used by the average doctor who suspects Lyme. The ELISA and IFA tests measure a patient's antibody, IgM and/or IgG, in response to exposure to the Lyme bacteria. These are usually done with blood drawn from the patient but may also be done on fluid from the spine or from a joint. Antibody testing is generally done in a two-step process, using either the ELISA or IFA followed by the Western blot test. ELISA is considered a more reliable and accurate test than IFA, but IFA may be used if ELISA is not available. The Western blot test (which is a more specific test) should be done in all people who have tested positive or borderline positive (equivocal) in an ELISA or IFA test. While the ELISA test is more reliable than the IFA, in and of itself, it is not very reliable at all. If the patient is not producing antibodies (either too early or later in the disease), false negatives may occur. Current ELISA tests have an estimated 65% failure rate of correctly detecting Lyme infections. One of the leading laboratories that tests for Lyme, IGeneX, Inc., will only perform the ELISA test when Western Blots are ordered in conjunction. Unfortunately, while these tests are not very accurate when it comes to detecting Borrelia burgdorferi infection, many physicians who have not familiarized themselves with their high failure statistics, take them as being a definitive diagnosis source. Consequently they will tell their patients they do not have Lyme disease based solely upon results from these tests when in fact, that patient may very well have a case of Lyme that was not correctly detected. If utilizing a first line test, the PCR is considered the most reliable and may be a better option over the ELISA or the IFA. The Western Blot tests (IgG and/or IgM) are much more sensitive and specific than the above ELISA tests. With the Western blot, the laboratory can visualize the exact antibodies you are making to the Lyme bacteria. In some cases the laboratory may be able to say that your “picture of Lyme antibodies” is consistent with early disease or with persistent/ recurrent disease. Not all patients have antibodies at all times when tested. Antibodies are more commonly detected within the first year after infection, although re-infection may cause a significant rebirth of antibodies. At most, only 70% of patients have antibodies early, and the presence of antibodies alone does not make a disease diagnosis. While this is a much more sensitive test to detect the bacteria, it also can have reliability problems if it is not done correctly. Never the less, it may still be the best tool in diagnosing Lyme Disease. • Lyme bacteria are not always detectable in the whole blood, even in active disease. The bacteria like to hide. • Medications taken for other ailments and pre-existing conditions can interfere with the tests. • Every patient responds differently to an infection. • Antibodies may only be present for a short time and at certain times in the stages of the disease. • For patients with clinical symptoms of Lyme Disease who test negative by the IgG or IgM Western Blot, the Whole Blood PCR or the LDA/Multiplex PCR Panel on urine may be appropriate. There are physician-developed antibiotic protocols to enhance the sensitivity of the LDA. In addition, there seems to be increased sensitivity of this test during the start of menses. No matter which test is used, false positives and false negatives do occur. Diagnosis should not be made solely by test results. Lyme Disease is treatable although the results of the disease ravaging the body may be permanent. Antibiotics are recommended for a minimum of four to six weeks. More chronic cases may require a longer treatment or repeated treatments. Treatment is either oral or intravenous. Those diagnosed later or have developed more serious symptoms may need to be treated with multiple weeks/months of I.V. antibiotics. There are a wide range of treatments depending on the severity and stage of the disease. No one treatment is best although some are better than others. Chronic Lyme treatment is a controversial topic and requires monitoring and adjusting along the way to successfully combat the disease and the many symptoms associated with it. There is great debate as to whether a person is actually cured after treatment or is more along the lines of a person with Herpes that can go into remission until the immune system is stressed and then it resurfaces again. Depending upon your treating doctor and what you feel most comfortable with, some people opt for a strictly Western Medicine approach while others incorporate holistic and alternative treatments in addition to the antibiotics. It is a personal choice as to which the patient prefers and what works best for them. The most important thing to remember though is to use common sense and beware of treatments which may make things worse. Even if it may seem overwhelming and mind numbing to try to understand how a treatment works, it's always best to know what's being done to you. Afterall, you're the one that has to live with the consequences! If caught early, Lyme Disease is fairly easily treated with minimal problems. Unfortunately, delays in diagnosis and lack of appropriate treatment make getting rid of the disease much more difficult and allows it to do more damage to the body... with sometimes permanent and devastating results. Prompt attention and medical intervention can mean the difference between a quick recovery or a long and debilitating illness. In some instances, treatment may even mean the difference between life and death. If you feel that you may be infected, get yourself thoroughly checked and remember that a test is not a definitive diagnosis by itself. Find a doctor that will look at the whole picture, not just a test result. VI. The use of sprays is a personal decision so you must know the facts. Products that contain DEET are tick repellents. They do not kill the tick and are not 100% effective in discouraging a tick from feeding on you. Products like Permanone contain premethrin and are known to kill ticks. However, they are not to be sprayed on the skin. Permanone can be sprayed on clothing. Once it is dry it is assumed to be safe. Ticks are anti-gravitational. They are generally seeking the highest point. If they get on your body below the clothes line, one hopes they will travel up and die once they come in contact with treated clothing. Note: If the tick meets resistance on its journey to the top of your head it will stop and feed at that point. If you are wearing shorts and the tick gets stuck in the bend behind your knee the Permanone will not be helpful. VII. Lyme Disease is a 12 month problem. The best defense against LD is education. Lyme Disease symptoms vary from person to person. (lymes disease lyme's disease lime disease limes disease). The data and information presented in this web site are presented in good faith and believed to be accurate regarding Lyme disease (commonly misspelled lymes disease lyme's disease lime disease limes disease) and other related diseases. Any and all liability for the content or any omissions including any inaccuracies, errors, or misstatements in such data or information is expressly disclaimed. The web site is compiled for the sole purpose of informing community members of resources and information pertaining to Lyme Borreliosis Disease. Please consult a qualified Lyme ( Borreliosis ) Disease literate doctor for medical advice if Lyme Disease is suspected to discuss your Lyme Disease Symptoms.